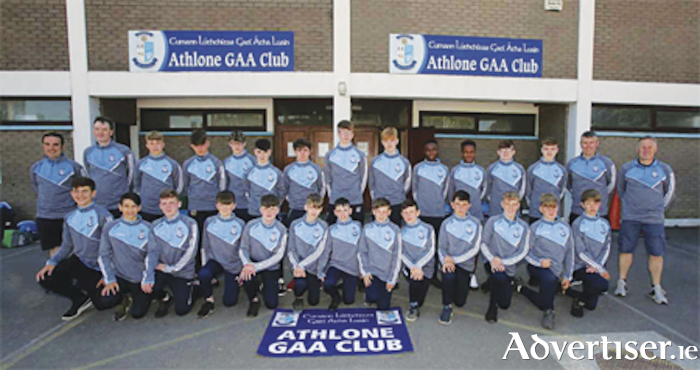 It was a fruitful weekend for the Athlone Under 14 football squad as they annexed the Division 7 title at this year's All Ireland Feile Peile na nOg. Played in sublime but extremely warm conditions, the Shannonsiders secured success following a competitive weekend of fixtures. Starting their quest for All Ireland glory, Athlone journeyed north to the Burren GAA club in County Down overcoming the challenge of Saval, but lost out to a strong Aghamore team from Mayo in their second fixture. A stunning display in game three saw the blue and white clad team ease to victory over the host club. The quarter final was a more even affair but playing with tenacity and flair Athlone disposed of Glyde Rangers/Sean McDermotts/Westerns from County Louth to secure a semi-final berth. Destination Navan for the penultimate fixture where the opposition was provided by JK Bracken of Tipperary. In line with the quarter final contest, the game was eagerly contested with Athlone sealing their final place with a three point win. Meath club Ballinlough proved doughty competitors in the final but it was the fitness of Athlone which saw them lift the title with a six point winning margin (0-7 - 0-1 ). Team captain Pierce Edmundson had the honour of raising the trophy aloft on behalf of a jubilant squad and management team - due reward for six successful games which are sure to live long in the memory.